The Old Foodie: Supping on Crane. Clark did not make any comment on his cooking method or the flavour of his supper, as is common with wilderness explorers, who did not take into account the curiosity of future gourmets. Luckily, others over the ages have commented, although those of us who have not eaten it are no closer to an honest vicarious experience as descriptions of the taste range from anything between chicken (not surprisingly) and beef, and the overall experience as being everything from palatable” to “excellent table meat”. 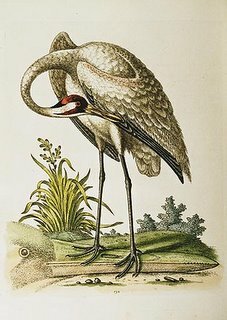 Perhaps the variety of the taste experience reflects the fact that the fifteen species of crane around the world inhabit a wide range of habitats and eat almost anything, so we should expect the flesh to taste different in different environments. There are other things too which influence our experience of a particular meal. Hunger – which Lewis and Clark had become very familiar with – is a powerful positive seasoning for the most indifferent food, but the symbolic aspect is also important – sometimes more important than mere taste. Crane mythology covers a very full spectrum, from the bird being symbolic of death in some Celtic traditions, and taboo in others (perhaps due to the belief that it was a “shape changer”), to being auspicious and sacred in Japan (probably because it was believed to have a long life and to mate for life). In Japan, it being a sacred animal, the crane was reserved for those of high rank, and carvers were trained in a special method of serving it called tsuro-bocho which would preserve the “spirit” of the bird, presumably so that this would be imparted to the emperor or honoured guest. Carving has always been a skill imbued with great significance and mystique, and the English language has many individual terms for carving specific meats. In the case of the crane, one “displays” it. Knowing how to display your crane is all very well, but first, you have to know how to cook it. In case an even earlier stumbling block is actually obtaining a crane in the first place, then the following recipe is perfect, for you can use turkey instead. The “pie” method refers to the use of a pastry “coffin” which functioned like a casserole dish, the pastry not necessarily being intended to be eaten. To bake all manner of Land-Fowl, as Turkey, Bustard, Peacock, Crane, &c., to be eaten cold. Take a Turkey and bone it, parboil and lard it thick with great Lard, as big as your little finger; then season it with two Ounces of beaten Pepper, two Ounces of beaten Nutmegs, and three Ounces of Salt, season the Fowl, and lay it in a Pie fit for it; put first Butter in the bottom, with ten whole Cloves, then lay on the Turkey, and the rest of the Seasoning on it, and lay on good store of Butter; then close it up and baste it either with Saffron-water, or three or four Eggs beaten together with their Yolks; bake it, and being baked and cold, liquor it with clarified Butter, &c.
Crane is hard of digestion, and maketh ill juice, but being hanged up a day or two before he be eaten, he is the more tender and lesse unwholesome. Thomas Cogan, 1584. I can't imagine eating crane. It just doesn't seem right. On the other hand it is a better choice than what they ate at Donner Lake. Hello Barbara. It is funny what we instinctively shy away from in food, isn't it? No logic to it really.